As a rule, banks and financial-services companies tend to significantly under-perform during bear markets. Due to marketplace fears and pressures, they often get driven to irrationally low prices. Because I like to buy when there’s “blood on the streets”, I always keep a few bank stocks on my watch list. Take JPMorgan Chase & Co. for example. The S&P 500 fell over 50% from October 2007 to March 2009, while JPMorgan fell nearly 70% from its 2007 high and 2009 low. Since that low, the stock has gained close to 300%. Not too shabby! Bear markets and corrections are nothing new; a correction happens about once per year and a bear market occurs once every three or four years. Technically, we just had a correction (a drop of 10%) but we’re not quite in a bear market (a drop of 20%) yet. The last bear market was eight years ago, so are we due for one? Who knows, but I’m putting my money on “yes”. If/when a bear market occurs, I will be looking for size and strength in the financial sector, so I’m keeping my eye on Wells Fargo and JPMorgan. I know, I know, Citigroup and Bank of America are monstrous too, but Citigroup scares me and Bank of America seems like a stalwart. Here’s how these banks performed in the last brutal bear market – I’m going from 2007 to 2009, and remember, our S&P benchmark lost over 50% during roughly the same period and returned 200% from the 2009 low. Wells Fargo: down over 75%, returned 485% since 2009 low. JPMorgan Chase & Co.: down nearly 70% returned 278% since 2009 low. For the purposes of this post, I will focus on Wells Fargo stock. 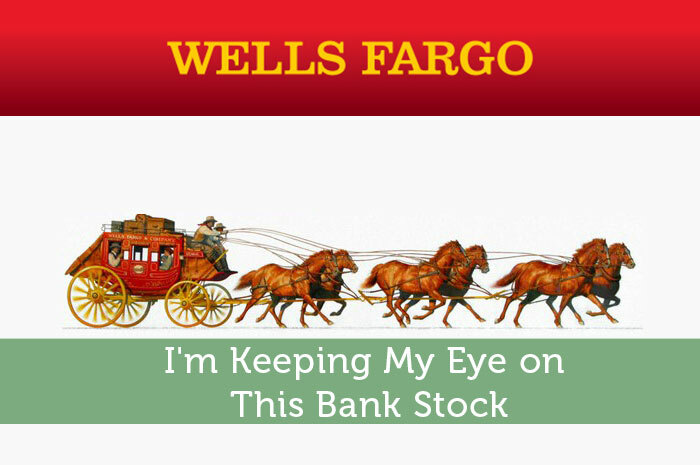 I’m not the only one who likes Wells Fargo – Wells Fargo is Warren Buffett’s biggest bet. Now, one can make the argument that after the meltdown nearly a decade ago, banks stocks are much safer because the underlying companies rely on stricter measures for lending and processing. They also benefit from rising interest rates, unlike utilities are REITs. On the flip side, a sinking tide lowers all ships. I’m talking about striking when the iron is hot: when the market has pushed bank stocks so far down that it doesn’t make sense not to buy. Banks have a negative stigma because of the financial crisis, but Wells Fargo is in great shape. It has been increasing earnings and dividends every year for the past few years. It has a 3% dividend and annual revenue growth of around 5% over the past 10 years. If the market were rationally priced at all times (please don’t butcher me, efficient market lovers), this should give a decent 8% annual return, in pace with the overall market. Yes, I know I’m using revenue and not earnings, but it’s a conservative outlook. However, I keep Wells Fargo on my watch list so I can buy when my risk/reward skews towards more than just an 8% annual return. Wells Fargo serves one third of all households in the U.S., giving it tremendous strength and brand recognition. While this can limit potential growth opportunity, the chances of Wells Fargo bouncing back from a bear market (provided the financials still work) are incredibly favorable. When times get tough and loans can no longer be paid, a bank’s equity gets chopped to pieces. If a bank takes too much risk, a poorly managed bank can go bankrupt. Pun intended. I view Buffett’s big bet on Wells Fargo as a vote of confidence in company management. If the company stays well-managed and conservative with its lending and growth processes, it should be a wonderful long-term investment. During the crisis of 2008, Wells Fargo cut its dividend and saw earnings plummet. Outside of that crisis, though, both earnings and the dividend have been remarkably stable. I think that the banking industry and the legislation encompassing it in red tape work together in tandem to help prevent another financial crisis, but individual investors, who make the market, are skittish. They will remember the pain of 2008 and sell at the first signs of trouble. Their lizard brains will tell them “banks = bad” and the profits will be made (you guessed it!) buying low.